Each robot in the world needs a purpose in his life. One likes to whip some cream, second mows the lawn and third likes to speak to you. But then, some crazy scientists invented a robot, that has to just stand by and do nothing. But why? Nobody knows. And such a machine will soon get bored and seek some fun to do. So cute little staks suddenly found themselves in the middle of an arena and do not even know how. A head taller opponent stands againts them and their only defense is to do what they do best. Jump on top of each other and fight as one. Small card game is also called based on them. 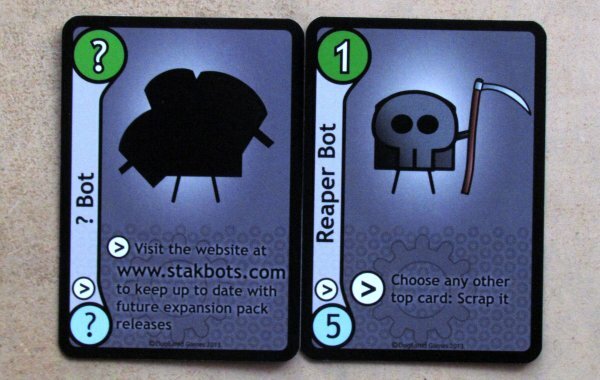 Its Stak Bots published by British company DogEared Games. 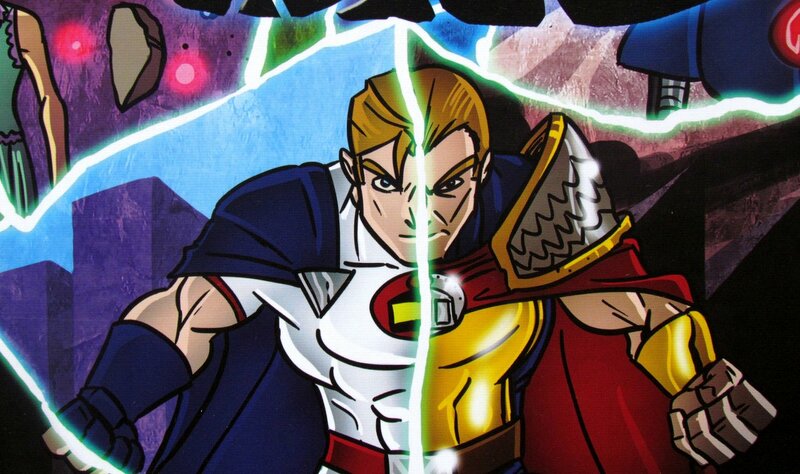 The robots and all the fun inside were created in 2013 by Tom Norfolk and he also personally illustrated the whole game. 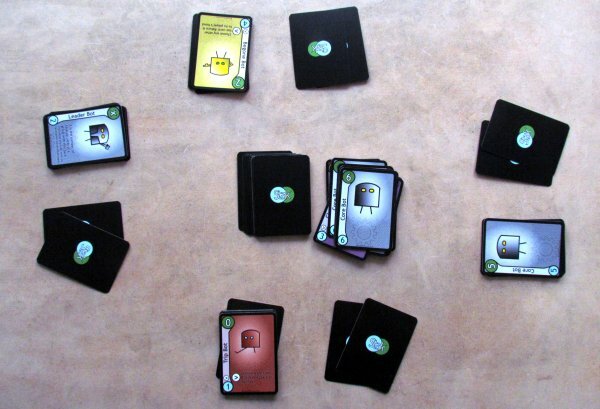 As it is usual with card games, all those small robots are stacked in tiny card box, which would be small to anyone. Its dimensions match the classic card size and thickness of sixty cards, that are hidden inside. Remaining free space is fill by sofa of English rules, that unfold into two A4 pages in width, but are full of great lettering and examples, so you do no need to worry about difficulty this time. Cards themself do not contain almost nothing else, than pictures of little robots. They occupy most of the space, but under their feet, you can find card text describing their special abilities. Left lane then contains not only name of each of them, but also the two numbers – one upstairs and one downstairs. Upper green circle indicates strength, which equals also to total number of lives, while blue has only informative character and its value shows general importance of the card. Bottom figure can be accompanied by action symbols, which are further described in text. They are present in the left strip only to provide clarity, when you are holding cards in your hand. 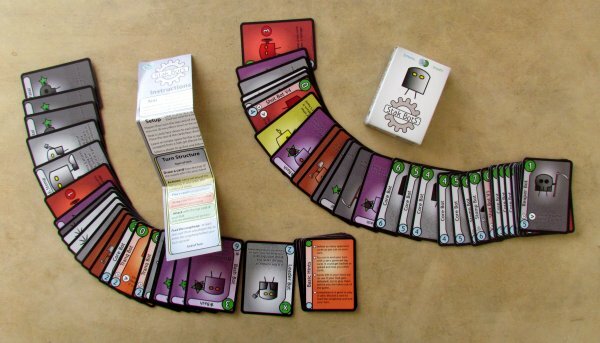 At the beginning of the game, it is necessary to properly shuffle all the cards together. After each of your opponents gets nine cards, he places them with image facing down. This is the so-called title Stak. 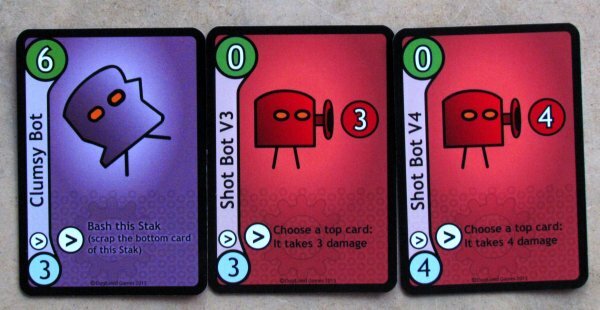 Top card is revealed by every player before the game truly starts, so everyone can see, what robot is on it. Everybody also gets other two cards, while remaining cards create drawing pile. 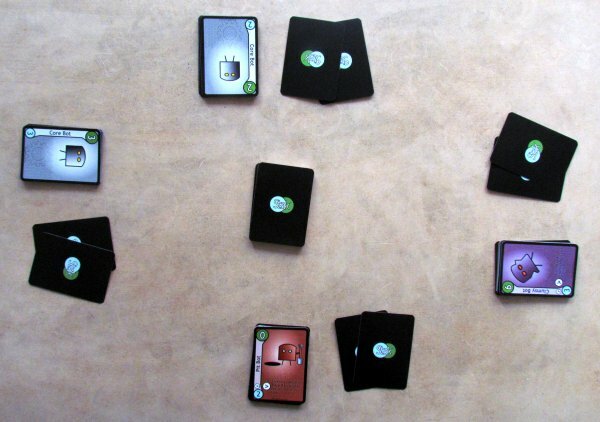 Players take turns, which always begins by picking up one card from the common deck. 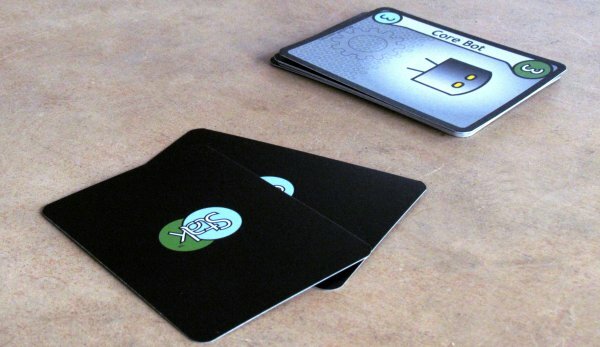 After that, players have a choice of three activities, that can be performed in any order and number, until he has sufficient cards to do what he wants. First up is the ability to play a card from his hand and place it face up on Stak. The player expands his set of active bots like this. It is essential not only his strength, which he puts up to the fight, but also an entry effect, that may be activated immediately. Player can also attack others at any time in his turn. This is done only by comparison of strength. If the injury is higher, than defender’s hit points, he then immediately leaves battlefield for the junkyard. 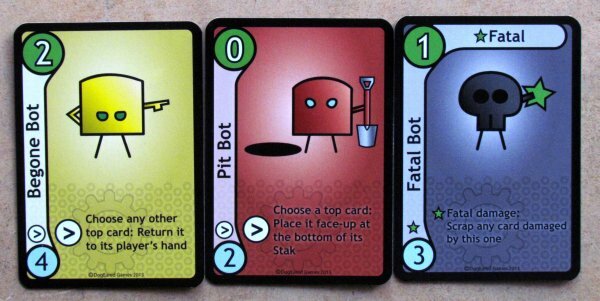 This is goal of each round, because each player’s turn must always end with death of at least one robot. This is a massacre, you think. Yes! 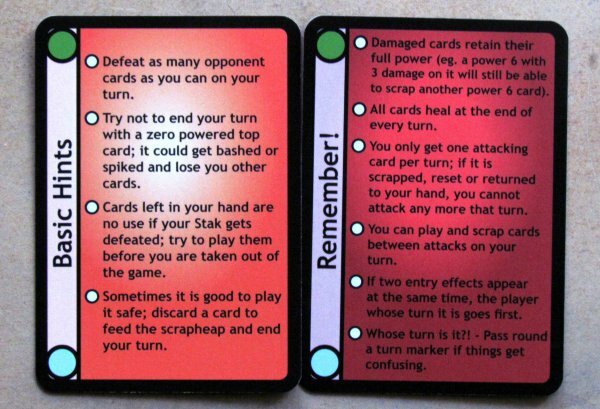 If player fails to do any attack, he will have to sacrifice one card of his Stak or hand. Only then is he allowed to pass the word to opponents. 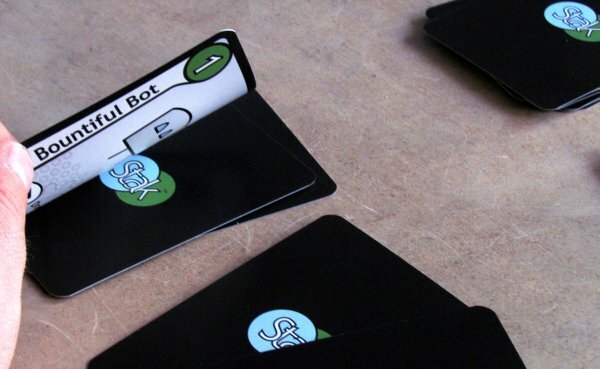 Players gradually liquidate robots and fight each other until robot pyramid of one of them on the table is empty. This warrior lost and will have to look at the dump for his robots, put them back together and come back for revenge. Who stands as the last one is the winner. Stak Bots are very simple game, that makes its sense especially with children. Its entire course is completely random and players are able to affect only few things. The winner is always eventually decided by luck. 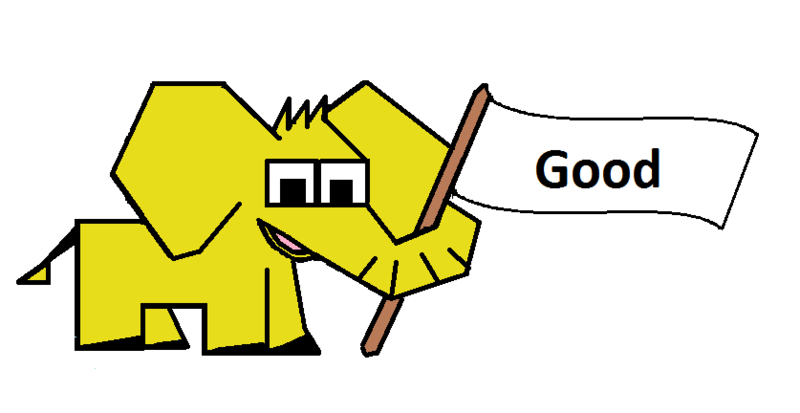 That does not mean, that you will not enjoy the match. At least children and parents, who are playing with them. And yes, those advanced players as well, if they are willing to become children-loving-robots for a moment. 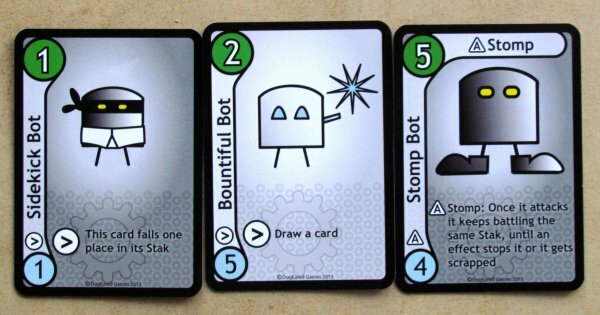 Cute little robots square illustrations and really basic rules of attacking guarantee, that its enough to entertain children. But for small robots coaches, there remains one obstacle and that is text. At least in here in Czech Republic, because there really is some text description on these cards. 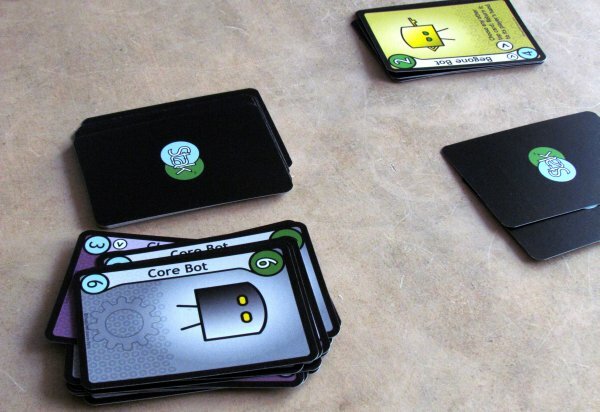 Each robot is unique and rules contain variants, that further enrich the game. Overall, you get the feeling, that this is an advanced game of War. 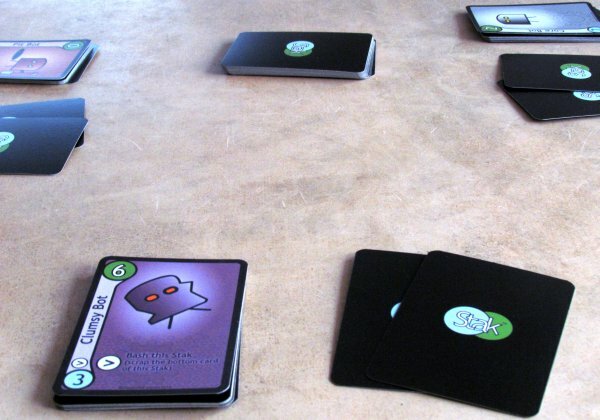 As a result, it is actually about attacks and a simple comparison of numbers on the cards. Fortunately, this is sufficient for amusement of children, especially when the game is flavored with interesting effects and contains robots. It is their clever usage, that can sweep your way to victory. Unfortunately, what does not fit at all, is in duels. Yes, games are quicker, but.. Game totally disappointed us in this number, because all the magic from attacking disappears. Players are shooting each other back and forth, but there is no choice, who to attack and thus the feeling of a larger battle. Length of the game is unpredictable, but it can be at least affected by starting amount of robots on the Stak. Sometimes, it is advantageous to discard robot on your own Stak to reveal new one. His initial effect activates and there may be a stronger fighter, than you previously had. But players must give up on one card and that is dangerous. With each card discarded this way, they are approaching a loss. But the suspense and curiosity, what is still hidden in the pile, is often simply stronger. Illustrations are indeed basic, but still provide a very good impression. 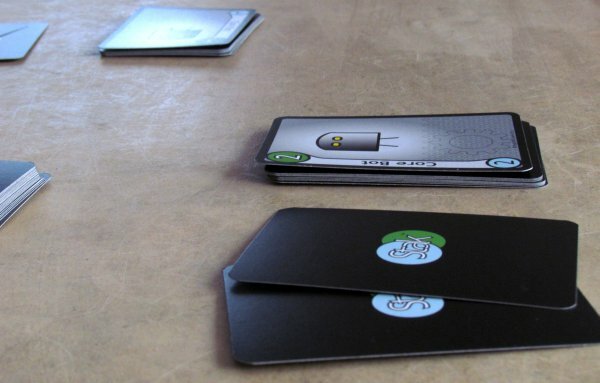 You hold cards in your hands all the time, but are of high enough quality and can withstand a lot of games. Rules themselves are not very clear, because they are not teaching mechanisms systematically, but in a pile of boxes scattered throughout the leaf. But they eventually contain everything important. 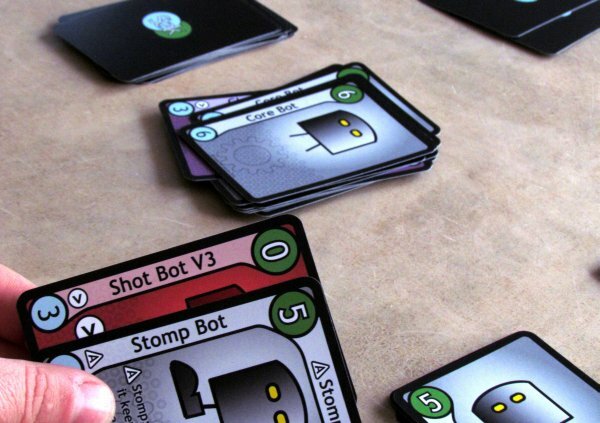 Stak Bots is a very simple game to satisfy demanding players. However, it can work well not only as children’s entertainment, but also as a cool fun on the road for less experienced players. All is managed by luck, but it does not matter that much, if it remains entertaining. And Stak Bots maintain a solid pace there. Stak Bots will have most visitors coming from lines of younger players, who enjoy taking their robots and kicking each other's butts. Robots gradually come into play randomly, but as the player is driven by curiosity and desire for better, he is also approaching his own end. Luck dominates almost everything and players have little chance to influence the outcome. 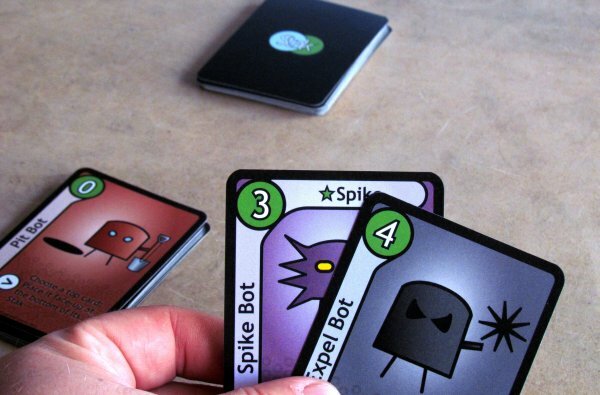 Nevertheless, robot combats are fun, especially for the less demanding and experienced players, who will be happy to set, how long they want the game to last.However, fights with two lack the proper charge and are not so fun. We can recommend it only for higher numbers. 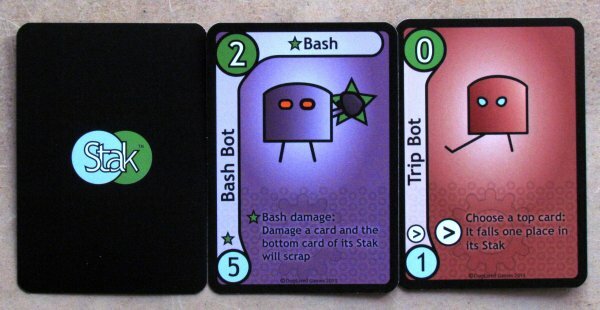 Stak Bots remains rather ordinary and average game, but will entertain without problems, especially children.